Alexandra Parade, Argyle Street, Bach Lane, Bell Street, Brunswick Place, Brunswick Street, Cecil Street, Chapel Street, Charles Place, Charles Street, Condell Street, Cremorne Street, Elliot Street, Fishers Lane, Fitzroy Street, Garfield Street, George Street, Gertrude Street, Gore Street, Graham Street, Greeves Street, Hanover Street, Hargreaves Street, Henry Street, Hertford Street, Highett Place, Hodgson Street, James Street, John Street, Johnston Street, Kent Street, Kerr Street, King William Street, Leicester Street, Little Charles Street, Little George Street, Little Gore Street, Little Hanover Street, Little Napier Street, Little Smith Street, Little Victoria Parade, Little Victoria Street, Mahoney Street, Marion Street, Moor Street, Napier Lane, Napier Place, Napier Street, Nicholson Street, Palmer Street, Princes Street, Regent Street, Rochester Street, Rose Street, Royal Lane, Smith Street, Spring Street, St David Street, Victoria Parade, Victoria Street, Webb Street, Westgarth Street, Wood Street, Young Street. The first main non-Government streets to be laid out by landowners in Fitzroy were Brunswick and Gertrude Streets. These two streets became the most important non-Government streets in South Fitzroy, mainly because their original line and length were extended by a number of successive landowners and subdividers. This contrasted strongly with the disparate pattern of subdivision and street layout which developed in other allotments in South Fitzroy. In 1854, the Victorian Parliament passed a special Act of Parliament, known as the Act for Improvements in Fitz Roy Ward in the City of Melbourne, designed to solve the street alignment problems in South Fitzroy. In the 1850s and 1860s, local politics in the Fitzroy-Collingwood area were concerned largely with the realignment of the worst of these ad hoc streets. The 1860s-1870s was a period of consolidation in Fitzroy's commercial strips, as the rude structures of the early decades were replaced with more substantial premises. This is most apparent along Gertrude and Brunswick Streets, and along Smith Street. The 1870s and 1880s saw the replacement of many earlier single-fronted shop buildings with rows of shops. The first power driven public transport to be introduced to Fitzroy was the cable tram. One route through Fitzroy ran along Nicholson Street from the city and divided into two routes: one ran along Gertrude Street to Smith Street and the other continued northward along Nicholson Street. Another route ran down Brunswick Street. (127) These routes were established in 1886 and 1887. Unlike the pattern of urban development in some of Melbourne's then outer suburbs, where the location of tram routes facilitated and stimulated the development of those streets into major commercial strips, the tram routes in Fitzroy were located along streets which were already consolidated commercial precincts. Industry, which had barely existed in Fitzroy in the 1850s had grown considerably by the 1870s and a number of major factories were being built and extended in the 20th century up to the Great War and beyond, including the famous MacRobertson Confectionary factory which started in Argyle Street in the 1880s. (128) The large factories and warehouses from this later period tower above the predominantly low rise nature of the early residential development. Along with the early development of the suburb and its proximity to Melbourne City, was the development of major institutions on its fringe, in particular, St Vincent's Hospital and The Convent of Mercy (Victorian Heritage Register), both of Roman Catholic origin. The Convent of Mercy and Academy of Mary Immaculate was founded in 1857 and consists of a number of buildings constructed over a period of thirty years at the corner of Palmer and Nicholson Streets. The complex is significant for its long-term and continuing association with Catholic education in Victoria (129). St Vincent's was founded in a Victoria Parade terrace house row by the Irish Order, The Sisters of Charity, in 1893; the complex eventually becoming the suburb's largest charitable institution. In 1905 they moved into a new four storey hospital building and by 1914 they were the second busiest hospital in Melbourne, benefiting from support provided by Fitzroy Council, the Fitzroy Football Club and the legendary John Wren. The Healy Wing was opened in 1928 and other wings followed, with the current complex covering a site bounded by Victoria Parade, Nicholson Street, Fitzroy Street and Gertrude Street. (130) A notable recent design was the St Vincent's Private Hospital since added to and altered. An extraordinary amount of comparatively homogeneous nineteenth century building stock has survived in Fitzroy, as compared to either the City of Melbourne or neighbouring suburbs such as Collingwood or Richmond. Some 22% of the buildings in the Heritage Overlay Area are individually significant compared with, for example, other large residential areas such as 7% for North Fitzroy or 9% for North Carlton. 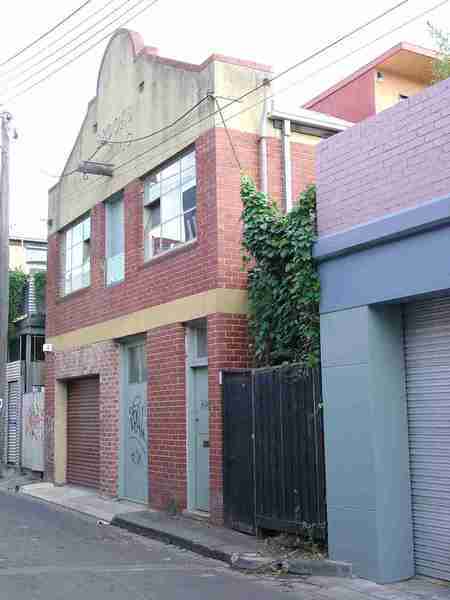 Some 18% of South Fitzroy buildings were erected by the 1860s as a demonstration of its early origins. The main development period in the South Fitzroy Heritage Overlay Area is that of the Victorian era with a substantial contribution from the Edwardian period. There is also a contribution from some well preserved inter-war buildings and individually significant places of all eras.
. Well preserved buildings from the pre Second War era.
. Early institutions such as St Vincent's Hospital and The Convent of Mercy.
. For the unusually high number of early Victorian-era and some Regency period buildings, being generally simply detailed and a clear reflection of the early date of Fitzroy's settlement.
. As a good example of the successful application of the Act for Regulating Buildings and Party Walls, and for Preventing Mischiefs by Fire in the City of Melbourne (Melbourne Building Act 1849), which forced the use of fireproof construction and gave South Fitzroy a character distinct from other inner suburbs such as Richmond and Collingwood, that have a greater proportion of Victorian-era timber buildings.
. As a substantially intact collection of predominantly mid to late nineteenth and early twentieth century building stock, interspersed with well preserved inter-war residential, commercial, retail and industrial buildings that contribute to the historical character of the area.
. For the ornate and exuberant detail of many late nineteenth and early twentieth century buildings in the suburb, reflecting the affluence of many of the inhabitants of this area, particularly in the late 19th century.
. For the early street, lane and allotment layouts, some original bluestone kerbs, paving and guttering, and some mature exotic street trees, providing an appropriate setting for this collection of residential, retail, commercial and industrial buildings.
. For the major early institutions that developed on its fringes, in particular, St Vincent's Hospital and The Convent of Mercy, as closely linked with the area's history, education and welfare within the metropolitan area. The South Fitzroy Precinct (HO334) is within close proximity to the Royal Exhibition Building and is adjacent to the World Heritage Environs Area precinct. The nineteenth century development and character of the South Fitzroy Precinct contributes to the broader setting and context of the Royal Exhibition Building. Views and vistas of the Royal Exhibition Building from within the South Fitzroy Precinct, including views to the dome from Gertrude Street, are also an important feature of the precinct. 117 B Barrett.The Inner Suburbs.p. 14. 119 B Barrett.The Inner Suburbs.p. 7. 120 B Barrett. The Inner Suburbs.p.17, and Fitzroy History Society. p. 7. 122 Fitzroy History Society. p.15. 123 Act for regulating Buildings and Party Walls, and for preventing mischiefs by fire in the City of Melbourne. (1949). Schedule b, Part 5, p. 235. 126 Figures quoted in B Barrett. The Inner Suburbs.p. 29. 127 See Sowerwine, Charles. 'Public Transport and the Fitzroy Identity', in Cutten History Committee of the Fitzroy History Society. Fitzroy: Melbourne's First Suburb. p. 11 6, see also Allom Lovell and Associates Pty Ltd. Hawthorn and Malvern Tramway Depots: Conservation Report. Prepared for the Public Transport Corporation, Melbourne, 1990. pp. 5-6. 128 See C Sowerwine . 'Public Transport and the Fitzroy Identity'. pp. 116-117.
unpainted cement, loading crane; windows altered; Proclaim Property Database: - property number correct?